12th October 2017, Mumbai, India: Favre-Leuba unveiled its iconic timepiece – the Raider Bivouac 9000 - at the Trident Hotel, BKC in Mumbai today, setting new standards in watch design and engineering, by bringing back the Favre-Leuba legacy in a new avatar, and Conquering the Highest Peaks with a functional time piece that truly pushes boundaries. 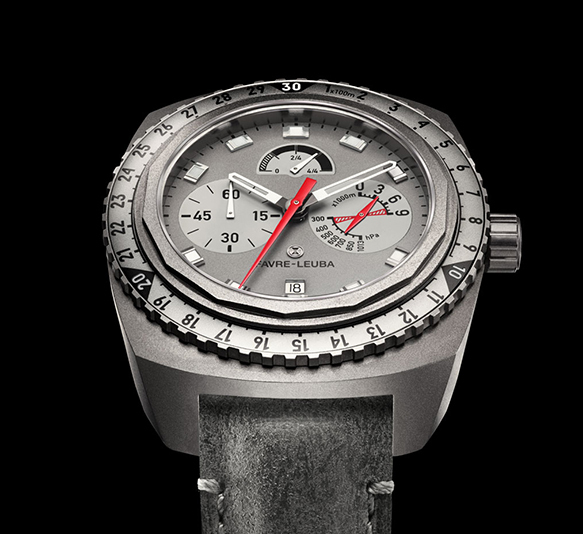 Switzerland’s second-oldest watch brand celebrated its 280th anniversary with the groundbreaking watch that demonstrates the ingenuity of the brand and by redefining what has until now been thought to be technically impossible The Raider Bivouac 9000 is indeed the ultimate instrument for all altitudes. The team of Favre-Leuba and Ethos were present at the luncheon to unveil the splendid time piece in India. They engaged the audience with a unique tribute to the Raider Bivouac 9000 by simulating the watch climb up to 9000m using tools and specially made equipment for such an endeavor. This exhibit proved the truly unique feat this purpose-built watch can perform, which is what has earned it the well-deserved caption – the ultimate instrument for all altitudes. The team also gave a deeper insight into the technicalities of the watch and what kind of research and development went behind creating this unique masterpiece. The Raider Bivouac 9000 is the first mechanical wristwatch capable of measuring altitudes of up to an incredible 9000 meters above sea level. In 1962, when Favre-Leuba launched the world’s first mechanical wristwatch capable of measuring air pressure and altitudes of up to 3000 meters above sea level, the outstanding reliability and precision of this watch, as well as the fact that it was extremely easy to use and read, quickly made it a feature on the wrists of mountain climbers, pilots, explorers; and almost every pioneer who strives to achieve great things. The Raider Bivouac 9000 is a homage to its legendary 1962 namesake, but has been improved and refined to make it capable of coping with the demands that are now placed on a highly functional instrument that is designed to be a reliable companion at extremely high altitudes. The Raider Bivouac 9000 still measures altitude with the aid of an aneroid barometer, but now does so up to an incredible height of 9000 meters above sea level. When designing the Raider Bivouac 9000, Favre-Leuba took inspiration from its own legendary timepieces to create a watch with a modern interpretation of the brand’s characteristic design elements. Ensuring that the dial is perfectly legible in any conditions was the key. The style of the dial is minimalistic, with nothing unnecessary to distract the view from the important displays. Unlike the 1962 Bivouac, the new version is also water tight - this is because the air inlet in the case, which is required for the barometer, is protected by a fine but tough membrane made from a micro-perforated hydrophobic material. This membrane allows air but not water or dust particles to pass through. The Raider Bivouac 9000 also attracts attention thanks to its impressive size-especially the robust case measuring 48 millimeters in diameter. It is constructed from light weight, hard-wearing, and hypo-allergenic titanium, which makes the watch comfortable to wear despite its size. The bidirectional rotating bezel, features Favre-Leuba’s trademark tetradecagon design, carries an altimeter scale divided into 50-meter steps. The arc extending across the sides of the case from lug to lug like a bridge spanning over time serving to further emphasize the dynamic aesthetics of this exceptional timepiece and is symbolic of the connection with its ancestor. The vintage-look leather strap also adds to its style statement. The red central hand indicates the altitude on the bidirectional rotating bezel, which carries a scale divided into 50-meter steps, up to 3000 meters. One full clockwise rotation of the red central hand thus indicates a climb in altitude of 3000 meters. During a climb, the small red hand of the subdial located at 3 o’clock continues to turn too, until, after three full rotations of the central hand, it arrives at its final destination of 9000 meters above sea level. The bezel is held securely in place by a two-way ratchet mechanism that prevents it from being unintentionally moved to a different position. The heart of the barometer is an airtight capsule made from a special alloy. The capsule expands when the air pressure drops as the wearer climbs and contracts when the air pressure rises during the descent. The expansion and contraction of the capsule triggers a linear movement, which is then converted into a rotational movement to indicate the altitude. The Raider Bivouac 9000 is also capable of displaying any changes in air pressure at the same altitude. The hectopascal (hPA) scale on the sub dial located at 3 o’clock displays the current air pressure on a scale ranging from 1013 to 300hPa. In India, this stellar timepiece will be priced at INR 5,31,000/-and will be exclusively available at Ethos Watch Boutiques from December 2017 onwards.